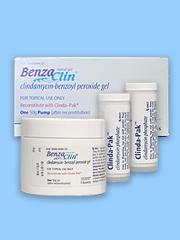 BENZACLIN is a combination of clindamycin and benzoyl peroxide that used to treat acne. Clindamycin and benzoyl peroxide are in a class of medications called topical antibiotics. The combination of clindamycin and benzoyl peroxide works by killing the bacteria that cause acne. tell your doctor if you have or have ever had stomach problems, ulcerative colitis, or severe diarrhea caused by antibiotics. Keep this medication in the container it came in, tightly closed, and out of reach of children. Store it at room temperature and away from excess heat and moisture (not in the bathroom). Throw away any unused medication after 10 weeks. Talk to your pharmacist about the proper disposal of your medication.